As a leading manufacturer of roll roofing and roofing underlayments, Tarco is regularly making news with its innovative products. This section is your resource for the latest about Tarco and its products and also serves as a historical record of company information and product introductions. LITTLE ROCK, ARKANSAS – Tarco, a leading manufacturer and supplier of roofing materials for the residential and commercial roofing marketplace, today announced the publication of a comprehensive, plentifully-illustrated white paper covering all aspects of the residential roofing underlayment product category. The premium underlayment used on Safeway self-seals around fasteners. “There is no way the water is going to seep around the nails,” explains Richard Foust, former president of Honolulu-based Hawaii Metal Roofing LLC, which supplied the metal panels and underlayment. Your Company Logo Now Can Be “Custom Printed” on Synthetic Underlayment! LITTLE ROCK, ARKANSAS – Tarco, a leading manufacturer and supplier of roofing materials for the residential and commercial roofing marketplace, today announced the launch of its in-house printing capabilities to provide multi-color printing for its EasyLay UDL synthetic underlayment products. LITTLE ROCK, ARKANSAS – Tarco today announced the appointment of Joe Prussel as the North Central Florida District Sales Manager. In his new role, he will be responsible for our North Central Florida one-step sales for Tarco. 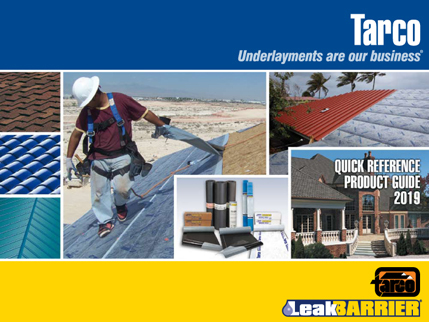 LITTLE ROCK, ARKANSAS – Tarco, a leading manufacturer and supplier of roofing materials for the residential and commercial roofing marketplace, today announced the launch of LeakBarrier UDL SA underlayment, a premium peel-and-stick underlayment made by bonding a polypropylene synthetic felt structure to a self-adhering modified bitumen layer. LITTLE ROCK, ARKANSAS – Tarco today announced the appointment of Nick Cwikla as Midwest District Sales Manager. In his new role, he will be charged with leading Tarco’s sales effort in the Midwest region. He will be based in Chicago. Tarco today announced LeakBarrier® EasyLay® UDL 15, an extremely lightweight, value-priced synthetic underlayment product for use as an alternative to asphalt-saturated felt in steep-slope roofing applications. LITTLE ROCK, ARKANSAS – Tarco today announced two new products suitable for use as underlayment in steep-slope roofing applications. LeakBarrier® EasyLay® UDL Basic and LeakBarrier EasyLay UDL 50 are exceptionally lightweight, synthetic underlayment products. Both are suitable for shingle, shake, slate and tile applications. Additionally, because of the exceptional thermal characteristics of its polymers, UDL 50 is ideally suitable for installation beneath a metal primary roof. Tarco today announced a roundup of its underlayment and membrane products, including Tarco LeakBarrier® Products and Tarco Roll Roofing Products. The new roundup makes product selection easier than ever by matching Tarco products to the type of roof application along with technical specifications, codes, installation tips, how-to videos and case studies. This article appeared in the August 2010 of Modern Contractor Solutions, which is a magazine for general contractors. It describes the use of Tarco LeakBarrier PS200HT on a school constructon project where the underlayment was uesd on three buildings, covering a total roof area of 100,000 square feet.